Tesamorelin (Egrifta™) is a synthetic analogue of human growth hormone-releasing hormone (also known as growth hormone-releasing factor) that stimulates the synthesis and release of endogenous growth hormone. It is the first and, so far, only treatment indicated for the reduction of excess abdominal fat in patients with HIV-associated lipodystrophy. This article reviews the pharmacological properties, clinical efficacy and tolerability of tesamorelin in patients with HIV-associated central fat accumulation. Subcutaneous tesamorelin was effective in reducing visceral adipose tissue (VAT), but did not affect subcutaneous adipose tissue to a clinically significant extent in two 26-week, well designed, clinical trials in patients with HIV-associated central fat accumulation. This reduction in VAT was maintained in the longer term in patients who continued to receive tesamorelin until week 52 in the extension phases of the two trials. However, discontinuation of therapy during this period resulted in the reaccumulation of VAT. Tesamorelin therapy was also associated with significant improvements in other body composition measures (e.g. trunk fat and waist circumference) and improvements were generally seen in some body image parameters (e.g. belly image distress). Tesamorelin was generally well tolerated, with treatment-emergent serious adverse events occurring in <4% of patients during 26 weeks of therapy. Most of these events were injection-site reactions or events known to be associated with growth hormone therapy (e.g. arthralgia, headache and peripheral oedema). 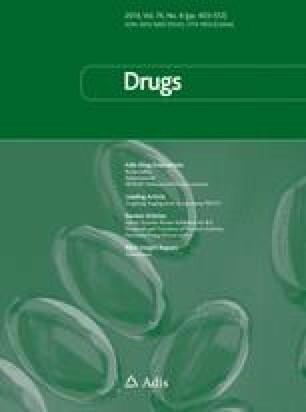 Although long-term clinical experience is needed to further assess the benefits and risks of therapy, current evidence suggests that tesamorelin may be useful for reducing visceral adiposity in patients with HIV-associated lipodystrophy, thereby potentially improving self image.